The number of bees and other diurnal pollinators is declining worldwide – due to diseases, introduced parasites, pesticides, climate change and the continuing loss of habitats. Artificial light disrupts nocturnal pollination and leads to a reduced number of fruits produced by the plant. This loss of night time pollination cannot be compensated by diurnal pollinators. The negative impact of artificial light at night on nocturnal pollinators might even propagate further to the diurnal community, as ecologists of the University of Bern were able to show. The number of bees and other diurnal pollinators is declining worldwide – due to diseases, introduced parasites, pesticides, climate change and the continuing loss of habitats. Now, Eva Knop’s team from the Institute of Ecology and Evolution at the University of Bern, shows for the first time, that nocturnal pollinators can be affected by artificial light leading to a disruption of the pollination service they provide. “So far, nocturnal pollinators have been largely neglected in the discussion of the worldwide known pollinator crisis,” says Knop. However, there are numerous nocturnal pollinators, and they play an important role for plants, as the study in the Bernese Prealps shows. Knop’s team found out, that flowers on meadows which were experimentally illuminated with street lamps are visited around two thirds less frequently by pollinators, than those that were on meadows without any light sources in the vicinity. This has an effect on the fruit set, and therefore the reproduction of plants. The study has now been published in Nature. In the last 20 years, the light emissions have increased by 70 percent, particularly in residential areas. “As it is possible that light sensitive insects have already disappeared in regions with high levels of light pollution, we conducted our study in the still relatively dark Prealps,” explains Knop. 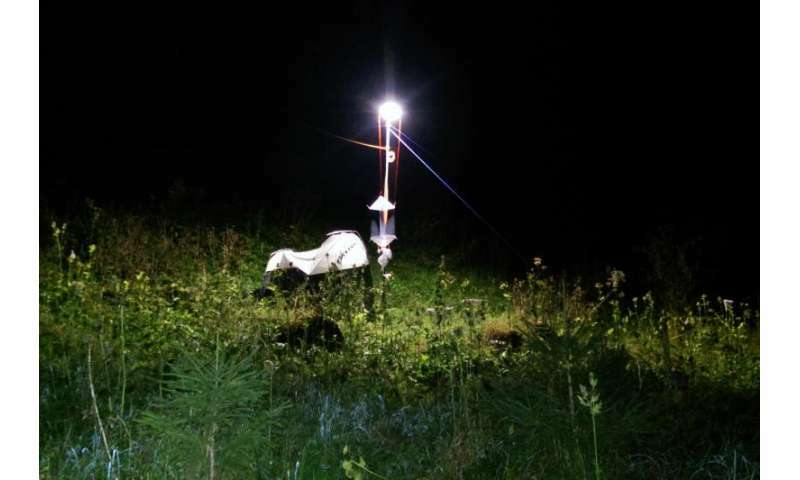 The researchers could show that during night a total of almost 300 insect species visited the flowers of around 60 plant species on ruderal meadows without any artificial light sources in the vicinity. Interestingly, on meadows with experimentally set up street lights, the nocturnal pollination visits were 62 percent lower than in the unlit areas. The LED lamps used, are used as standard for public street lighting. This loss of nocturnal flower visitors leads to a reduction of the fruit set of plants, as the researchers have proved for the first time, with the example of the cabbage thistle (Cirsium oleraceum). The pale flower heads of the cabbage thistle are a rich and easily accessible source of pollen and nectar, for numerous species of insects, and are amongst the most visited plants both during the day and at night. The team investigated a total of 100 cabbage thistles, which were growing on five meadows experimentally illuminated with LED street lamps, and five meadows without artificial light. The illuminated plants were visited much more rarely by pollinating insects at night, than the unlit plants. The decline in pollinators had a significant influence on the reproduction of the cabbage thistles: at the end of the test phase, the average number of fruits per plants was around 13 percent lower. “The pollination during the day obviously cannot compensate for the losses in the night,” says Knop. The study also shows, that the nocturnal pollinators indirectly promote the diurnal pollinators, by visiting the same plants. The underlying mechanisms are still unknown – a possible explanation could be that the plants have a fitness advantage thanks to the nocturnal pollinators, and therefore provide more nutrition for the diurnal pollinators. A loss in nocturnal pollination due to increasing light pollution, could therefore also indirectly have a negative effect on the diurnal pollinator community. According to Knop, this still needs to be researched in detail, as well as the long-term consequences of the pollination losses for the biodiversity. The findings have driven the researchers to demand action: “Urgent measures must be taken, to reduce the negative consequences of the annually increasing light emissions on the environment,” says Knop. This will be big challenge, as residential areas are worldwide increasing.